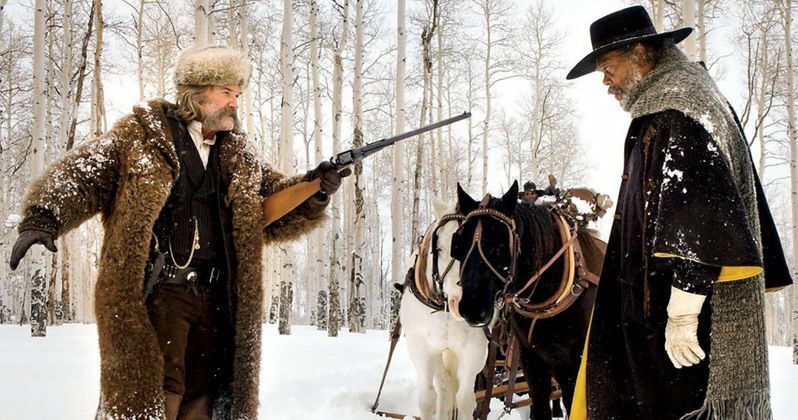 You may have heard that Quentin Tarantino has set out to equip 50 U.S. theaters with 70MM projectors as the premiere of his anticipated Western The Hateful Eight grows near. The reason is simple. The Hateful Eight will be released Christmas day in 70mm only. It will then be followed by its digital projection release in early January, two weeks later. This follows the same release pattern as Django Unchained. Quentin Tarantino and his cinematographer Robert Richardson went big with The Hateful Eight, shooting on 65mm film stock using classic Panavision lenses for a 2.78:1 aspect ratio presentation. The Christmas Day debut marks the widest 70MM release in 20 years. The director is a strong proponent of shooting on film, and led the fight to keep Kodak open. A full theater list has not yet been made available, but an update is expected closer to the December 25 release date. Set six or eight or twelve years after the Civil War, The Hateful Eight opens with a stagecoach hurtling through the wintry Wyoming landscape. The passengers, bounty hunter John Ruth (Kurt Russell) and his fugitive Daisy Domergue (Jennifer Jason Leigh), race towards the town of Red Rock where Ruth, known in these parts as "The Hangman," will bring Domergue to justice. Along the road, they encounter two strangers: Major Marquis Warren (Samuel L. Jackson), a black former union soldier turned infamous bounty hunter, and Chris Mannix (Walton Goggins), a southern renegade who claims to be the town's new Sheriff. Losing their lead on the blizzard, Ruth, Domergue, Warren and Mannix seek refuge at Minnie's Haberdashery, a stagecoach stopover on a mountain pass. When they arrive at Minnie's, they are greeted not by the proprietor but by four unfamiliar faces. Bob (Demián Bichir), who's taking care of Minnie's while she's visiting her mother, is holed up with Oswaldo Mobray (Tim Roth), the hangman of Red Rock, cow-puncher Joe Gage (Michael Madsen), and Confederate General Sanford Smithers (Bruce Dern). As the storm overtakes the mountainside stopover, our eight travelers come to learn they may not make it to Red Rock after all. The Hateful Eight almost didn't happen, after the script leaked, which lead to a lawsuit from the director, who sued Gawker media for publishing it on their site. Quentin Tarantino changed his mind after a successful stage reading in Los Angeles that was met with copious applause. The first footage from the movie was shown off last month at Cannes, and quickly became a festival highlight. The limited The Hateful Eight release will be going up against Star Wars: The Force Awakens in its second release. Also opening that day are The Revenant starring Leonardo DiCaprio and Tom Hardy, the anticipated family sequel Alvin and The Chipmunks: The Road Chip, Will Smith's football injury drama Concussion, the Point Break remake, and the biopic Snowden, which pits Quentin Tarantino directly against his old rival Oliver Stone. What will you be seeing on Christmas Day?